When it comes to Scottish wedding destinations, none are quite as dramatic as Dunnet Head Lighthouse in Caithness. 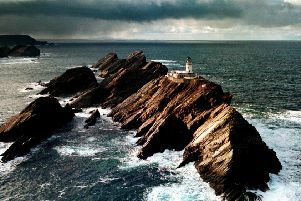 The most northerly point of mainland UK and closer to Norway than London, the 19th-century Stevenson lighthouse is as beautiful as it is remote. Owner Norman Brockie says: “We host small weddings in the Engine Room although brides generally insist that the ceremony takes place next to the lighthouse or even on the cliff head. The nearby Castle of Mey, surrounded by extensive gardens, dates back to the 1500s and offers similarly impressive panoramic views but from a regal setting. With spectacular grounds, walled gardens and a picturesque driveway along which newly-weds can be piped towards a drinks reception, there are many opportunities for photographs. But it is in the south of Scotland that you will find perhaps the most unusual of wedding venues. With unrivalled originality, Roulotte Retreat is an imaginative and intimate destination less than a half-hour drive from the Border. Nestled below the picture-postcard Eildon Hills, south of Melrose, the retreat comprises a selection of French-carved roulottes – Romany caravans – around a scenic lochan. Over on the west coast, the five-star Lodge on Loch Goil, in Argyll and Bute, also provides an intimate setting, and its owners claim to have the world’s only licensed tree house, which overlooks the alluring loch. The tree house seats up to 24 for a ceremony, or eight for a more initmate gathering around a wood-burning stove, while the Arts and Crafts-style dining room is wonderfully decorated and the orangery, seating 70 during ceremonies, is ideal for ceilidhs. Meanwhile, Balbirnie House in Glenrothes, which recently won the best Global Wedding Retreat of the Year title at a prestigious awards ceremony in Dubai, is a must-see option for people planning to wed in the east of Scotland. Set within 400 acres of parkland, the grand country house offers several settings in which to tie the knot, including the fairy-tale gardens, ballroom, orangery or long gallery. It can hold up to 216 guests at a wedding ceremony, and 250 at the reception. Balbirnie House is also just 30 miles north of Edinburgh and 30 miles south of Dundee, making it the perfect halfway point for family and friends who live further afield.